With so many technological advances being made every day, it may seem strange to hear that direct mail campaigns are still very much used in marketing today. Not only are they used, but they work too! In 2015, the Direct Marketing Association found that direct mail campaigns outperformed all digital channels by nearly 600%! As a print business, you really ought to be making use of printed marketing as much as possible. Where many companies will have to outsource their printing, you have the advantage of being able produce your own quality mailers. So, why do direct mailers work so well? Inboxes everywhere are stuffed full of promotional emails as more come in every day. When you open your inbox to find two marketing emails for every one that’s actually of interest to you, it can be so easy to select all and click delete, without even reading them. 57% of abandoned email addresses are because of receiving too many emails. Direct mail, however, does not have the same issue. In fact, 74% of consumers look forward to seeing what’s in their letterbox. Plus, once opened, people take longer to look over a letter than they do an email so they’re more likely to take in what you’re offering them – especially if you make your mailer a little bit different. Perry Process ran a great, attention-grabbing campaign to encourage people to trade in their unwanted process equipment for cash. Inside were fake bank notes (sure to pique your interest) and a card saying Don’t Throw Your Money Away! Once they had their audience’s attention, their message was much more likely to get through. Often, people go online because they’re trying to do something, whether that’s checking their emails or searching for something on Google. Whatever they’re doing, it’s frustrating to be interrupted by ads upon ads upon ads. 72% of internet users say that pop-up ads are “very annoying” and 49% of those say that banner ads are just as bad. Direct mail doesn’t interrupt what you are doing and so clients are already in a more receptive mood when they open it, because they haven’t been interrupted. With printed media, you actually have to physically hold it in order to deal with it. You have to hold it, make an effort to open it, and take it somewhere to read. Somehow, that extended contact is enough to settle the images into your mind. Research has found that consumers who received direct mail offers were able to recall the brand 75% of the time, compared to only 44% of the time by people who received digital only copies. In recent years there has been a growing distrust of the internet as people become more wary of accidentally downloading a computer virus or losing bank details and other important information. Print is much safer in that respect. Print isn’t asking you to give your details away electronically. In fact, 56% of customers find print marketing to be the most trustworthy type of marketing. Research by the Royal Mail also shows that people associate direct mail with being “believable” and “reliable” but the same adjectives were not applied to email marketing. Of course, just because people respond better to direct mail, that doesn’t mean you can post just anything through your customers’ letterboxes and expect results – you’ve still got to work on how you can deliver your campaign well. They say that 40% of what makes a campaign successful comes from good targeting. Due to the increased costs, targeting is especially important for direct mail campaigns – you want to make sure that you’re getting your money’s worth. If you send out a mailer to a load of customers who aren’t interested in the offer you’re promoting, you’re paying too much for what you receive. However, if you track your clients’ purchasing history to find out what products they’re interested in/when their busy periods are/how much they spend per order, you can identify which of your clients will find this offer relevant and your campaign will be much more cost effective as a result. These days, people expect a certain level of personalisation. Have you ever received an email or a letter directed to “the occupier” or “customer”? It doesn’t feel great, does it? People want to feel unique and appreciated in their own right, not just because they’re one of many clients. So, personalising your mail by using their name is very important as it makes your customers feel valued. If you can take personalisation even further, they’ll appreciate it all the more. Why not include the address of the nearest vender that they can find your product, like Kit Kat did for their new Chunky bar? Without testing your mailers, you’ll never know if you’re generating the best results possible. You could make variations on all sorts of things – your campaign title, the teaser copy on the front of your envelope, using blank envelopes or decorated ones, using real stamps or not – anything! Send out variations to a small sample of customers, assess which variation performs better and then continue with that one for the rest of your targeted customers. Use different discount codes for each variant so that you can track which receives a better response. You’ll know yourself how much more exciting it is to receive a package than it is to receive just a letter. Even adding just a little bit of weight to your mailer can make recipients more interested and more likely to open it. Even better than that is if you can create some unusual shapes that they can feel through the envelope. Perhaps you can give your discount code on a gift card? 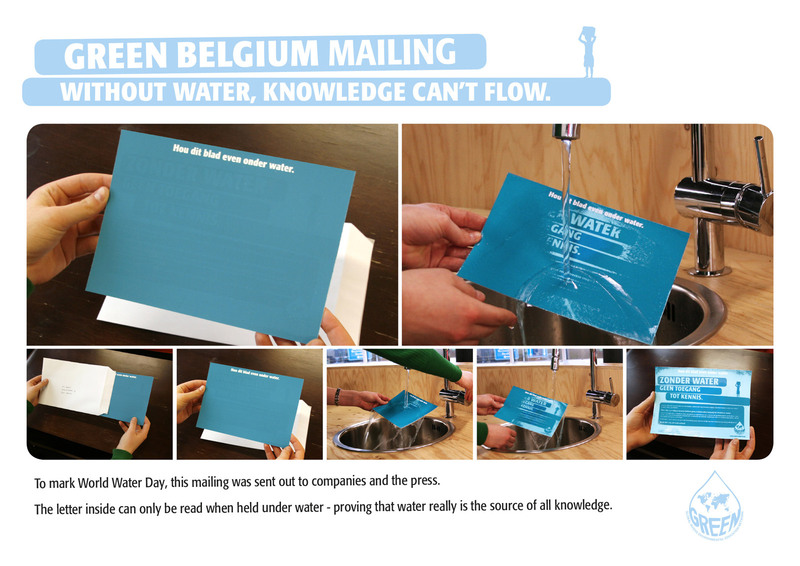 This mailer encourages companies to participate in Earth Hour with its visually impactful message. Plus, it gives them a candle so that they can still see when they’ve turned off all the lights! Finally, just like you would include a link on your promotional email to take people directly to the right page, you want to make it as simple as possible for your recipients to carry out the desired action. If you want people to return a form, give them a pre-addressed and pre-paid envelope. If you want them to visit a certain website, include a QR code. Try and do as much for them as possible so that it’s not an inconvenience for them. One way you can target your recipients is purely by location: perhaps you could send out a mailer to all the small businesses near you? Find more ways to attract business from local companies with our 20 Local Marketing Tactics.